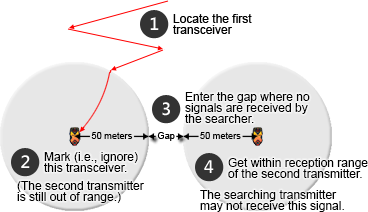 In early 2014, the DAV German Alpine Club discovered that if you place two transmitting beacons at a distance where their signals are so far apart that they cannot be simultaneously received by a searching beacon (i.e., they say at least 60 meters, but it's likely the transmitters will need to be further apart, especially if the searching beacon has a long search range like the Pieps DSPs), and you then find and mark (i.e., suppress) one of the transmitters, the Pieps Sport and DSP Pro, the ARVA "Evo" family, and the ARVA 3 Axis won't receive the second transmitter's signal when you get within its range. This is a very specific and probably very rare scenario (i.e., a multiple burial with the transmitters so far apart that you can only receive one signal at a time, but you then mark the first transmitter that you find, move to a gap between the transmitters where there aren't any signals, and then get close enough to the second transmitter that you should receive its signal). Pieps issued an update to remedy this potential situation. Note that the searching transceiver will "see" the second transceiver if you toggle back to Send and then to Search. You can read the DAV report and Pieps' response.